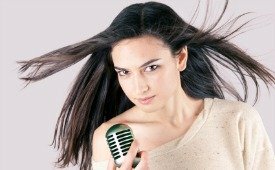 I want to share with you some vocal scale exercises that will improve your voice automatically as you practice them. I’ve got a little twist for you that will make practicing fun! There are certain words that bring about a specific reaction in your voice. Here’s a hint. It has a lot to do with the vowel sound in the words that you sing. Some words have open sounding vowels, while some have a closed sound to them. Take that word “cat” for example. Say the word “cat” and notice how it sound “open” and “wide”. This is due to the vowel “A”. Now, instead of “cat”, say the word “Mom”. Notice how this is much more closed off than the more open “cat”. For example, if you practiced singing a high C with a closed sounding word like “mom”, pretty soon your vocal chords would get used to making the coordination necessary for a “high C”. Also, you would automatically begin to use the right amount of air pressure to hit this high C every time. It would eventually get so easy to sing this high C that you would be able to gradually widen the vowel. At this point you would be able to sing any word on the high C.
So long story short. Some words are easier for your voice to sing than others. If you practice singing with these “easier words”, and master your voice at this level, you can begin to sing harder words. Pretty soon you will be able to sing any word you like on any note. Ok, here’s a vocal scale exercise that will get you off to a flying start! Firstly you need to find a song that you know and enjoy singing. Go get it now. Now, you need to sing this song, except instead of singing the words, replace them with the word “mom”. That’s right! I know it sounds a little silly singing, “mom mom mom”, but practicing this will eventually allow you to hit every note perfectly. Sing your song through once, and write down the difficulty that you felt when you sung it. Pay special attention to the hard bits. Maybe even give the song a difficulty rating out of ten. Now, sing the song through three times using just the word “mom”. Feel how tension begins to drop off, being replaced with a more relaxed sensation. After this, sing the song again normally. Note the difficulty rating. You can do this vocal scale exercise with any word with a “closed vowel” sound. Once you have mastered the “closed” words, you can try doing the exercise with more “open” sounding words. Here’s some words to get you started. Mom, Nay, No, Go, Gug. All these words have a very closed sound. Experiment and find out which is easiest for you. Once you have your favorite, take a few songs and replace the words with your chosen word. Learning to sing really well is about repeating “successful singing”. Using these words will put your voice in a “success” state. Use this technique and you are building your voice on a correct foundation. Muscle memory will develop and you will find that singing will become much easier. 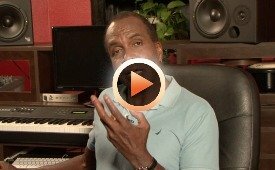 To learn much more about developing your voice and putting it in a "success state", check out the vocal scale exercises in the Singing Made Simple vocal program. These exercises are highly effective at erasing bad habits, and replacing them with a "successful", great sounding voice. You're voice will improve out of sight as you practice the vocal scale exercises in this excellent program.